Mûmakil (sing. Mûmak) were pachyderms, similar to modern-day elephants – though they were much larger. 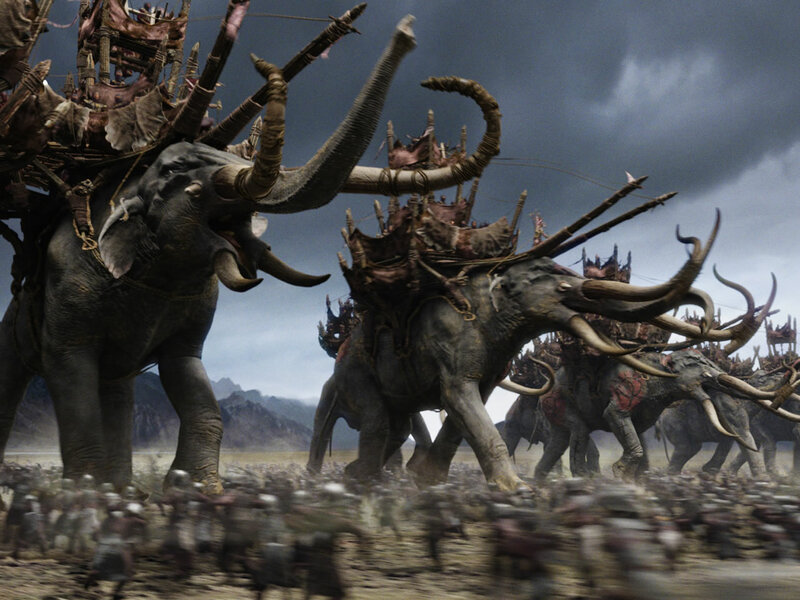 Mûmak was the term used by the Rangers of Ithilien; Hobbits referred to them as ‘Oliphaunts.’ They were used by the Haradrim as war-beasts; they carried war-towers, frightened horses, and were the Haradrim’s defensive force during battle. Their skin was so thick that they were nearly impenetrable in battle; the only way to kill them was to shoot them in the eye, and then they would often run amok. Foster, R. (2001). Oliphaunts. In The complete guide to middle-earth: from the hobbit through the lord of the rings and beyond. New York: Del Rey. Tolkien, J. (1954). The lord of the rings: the two towers. New York: Del Rey. Tyler, J. (1976). Mûmak. In The complete Tolkien companion. New York: St. Martin’s Press.